Don't get bored by basic healthy snacks (or worse, turn to fatty junk food). We've got some super-simple ways to upgrade your munchies! Bake carrot sticks into French fries. Sure, crunchy carrots are a good snack, but they also have that bummer diet-food feel to them. This is the easiest upgrade ever: baked carrot fries! If you get a snack attack in the middle of a Netflix marathon, toss a batch of carrot sticks in the oven to bake until mostly crispy. 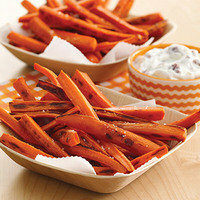 They taste similar to sweet potato fries but have a small fraction of the calories! Freeze applesauce for a too-good frozen treat. 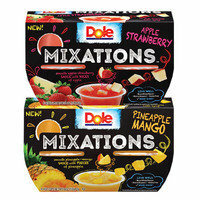 We had the wacky idea to freeze Dole Mixations (an applesauce-like snack), and we couldn't believe the utter deliciousness of the results. It's like DIY sorbet! Try it with any applesauce with a reasonable calorie count. (We tend to stick with unsweetened applesauce; look for flavored varieties!) If the cups are frozen solid, just let 'em sit out for a few minutes before sticking in your spoon. Give Greek yogurt the savory treatment. Fat-free plain Greek yogurt is a healthy fridge staple. We often add no-calorie sweetener and fruit to turn it into a sweet snack. But that's not all the thick yogurt can do! Add savory herbs and spices to make a protein-packed veggie dip. Try salt, dill, garlic powder, and lemon juice with sliced cucumbers for dunking. It's like a twist on tzatziki sauce! 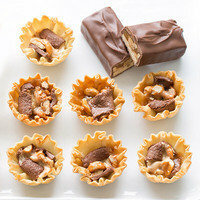 Bake wonton wrappers into edible cups. Wonton wrappers are magical. Spray a muffin pan with nonstick spray, press the wrappers into the cups, and bake at 350 degrees until crispy (about 8 minutes). 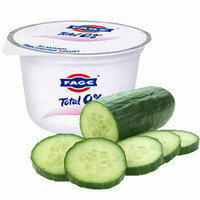 Now fill those crunchy cups with beans 'n cheese, fruit 'n yogurt, egg-white scrambles, or scoopable salads. 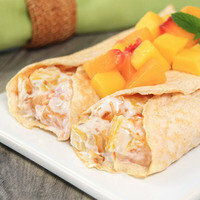 It's a great way to turn leftovers into a fun snack. 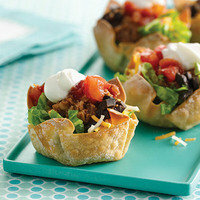 Standout usage: these Tiny Taco Salads! Hit the baby-food aisle for surprisingly fantastic finds. If you don't have a wee one, you might not be privy to the bounty in the kiddie aisle. Find perfect portions of freeze-dried fruit, yogurt melts, and crunchy treats with healthy ingredients! Heck, even a jar of pureed mango can make a tasty snack. 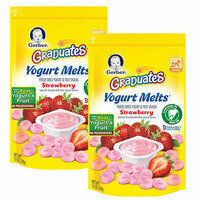 Also good: kid-style squeezable yogurt. Just because certain snacks are branded for kids doesn't mean grown-ups can't enjoy them! 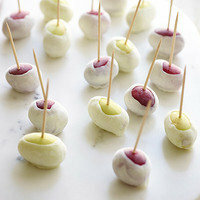 Stick grapes in the freezer, and prepare to be wowed. If you've never had frozen grapes, you don't know what you're missing. The flavor is sweeter and more intense! This is also a great trick when you buy a too-big bunch of grapes and don't want them going bad before you get to the bottom of the bag. Score all around. Even cooler? Dip 'em in yogurt before freezing! Make two-ingredient protein crepes, and stuff 'em with anything. This will blow your mind. Just whisk 1/2 cup liquid egg whites with 2 tbsp. plain protein powder and your favorite seasonings. Cook the batter into two thin pancakes, top away, and roll ‘em up! Add leftover stir-fried veggies for a savory snack, or try fruit tossed with low-sugar preserves for a sweet treat. More info and recipe ideas here. And watch this video to see the crepes being made! Craving chocolate? Chop 'n bake your candy to make a single bar go far. Rather than biting into a chocolate bar and having it disappear before you know it, chop it into chunks, and pop 'em into frozen mini fillo cups. Then bake those things into tiny candy pies! We gave this treatment to a Snickers bar, but feel free to improvise with your favorites. Today, December 20th, is National Sangria Day. Our Sparkling Spiced Apple Sangria is perfect for the holiday season! Click "Send to a Friend" before your pals' next snack attack hits!